Welcome at Paradise Fishing Gambia´s website! The Gambia is the perfect destination for fisherman who would like to catch a variety of different species. We offer several types of fishing trips. You can fish the Atlantic Ocean or take a trip down river through the mangroves. You will be accompanied by experienced members of our team who have been fishing here in The Gambia throughout their life’s. They will be happy to take you to the best fishing spots, share local fishing tips and show you skills so you don’t have to lose baits. 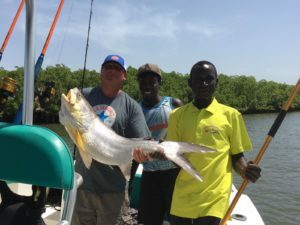 Paradise Fishing Gambia is a well-known established company in West Gambia this has been noticed due to our high standards in quality, safety and service level. Besides this, Paradise Fishing Gambia is the only company which offers blue water fishing. We are also fully licensed. Our trips are always included: a experienced captain/deckhand, safe boat and engines, fishing gear, bait and mineral water. We highly recommend you to bring the following items during a fishing trip: sun cream, covering clothes, a cap, sunglasses, towel and a good mood! If you have any questions, requests or if you want to book a fishing trip, do not hesitate and please contact us!